Cruising around on foot at Cavallino Cars & Coffee was a delight – classics to the left of me, modern supercars to the right. While I would’ve been content to breathe in the sights and sounds and call it a day, there was Speedhunting to be done and I was seriously spoiled for choice. Not a bad problem to have, is it? 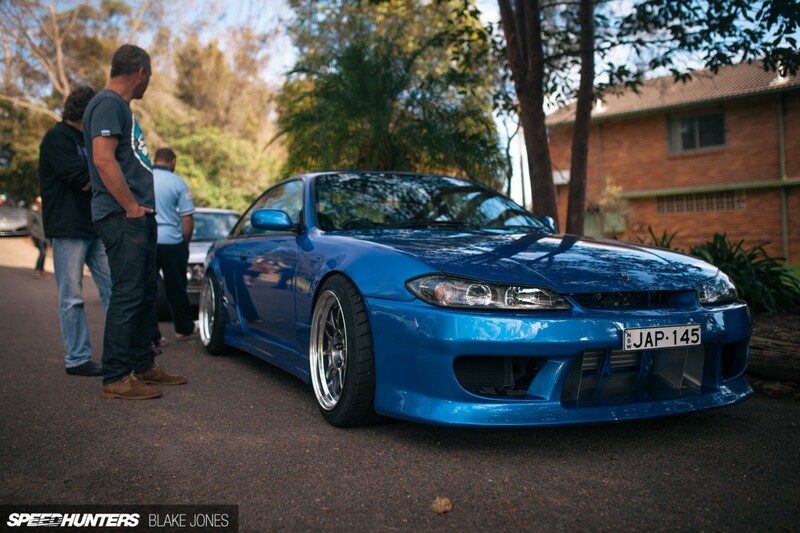 In the end it wasn’t a rare European or muscular American that really captured my attention, but this Nissan S15. If the colour looks familiar there’s a good reason why – it’s a pearl hue borrowed from the distinctive Subaru WRX STI. 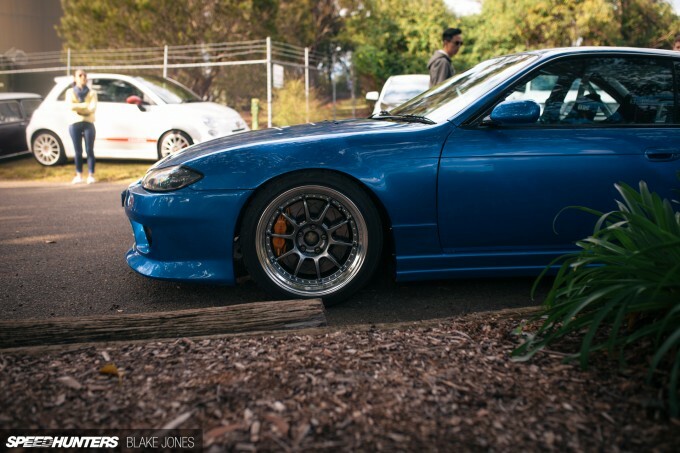 Hang on a second, what happened to our S15? As I’m sure the eagle-eyed amongst you had spotted already, this car is actually an S14 chassis which has lifted the front end from its successor, a process sometimes referred to as a ‘strawberry face’ conversion. Combine the Japanese word for one ‘ichi’ with the word for five ‘go’ and you get ‘ichigo’, which translates as strawberry. 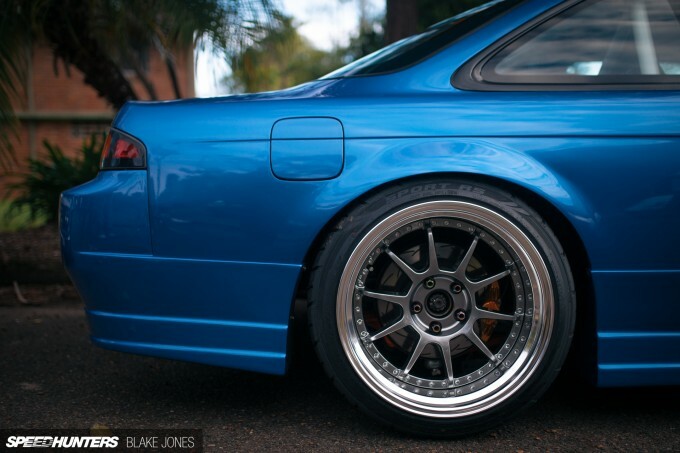 At this end of the car, the simple lines of the S14 are accentuated by C-West side skirts and rear bar. The guards have been pumped and flared to accommodate the 18×11-inch SSR SP3s shod in semi-slick tyres, behind which are R33 GTS-T brakes for some additional deceleration Gs. 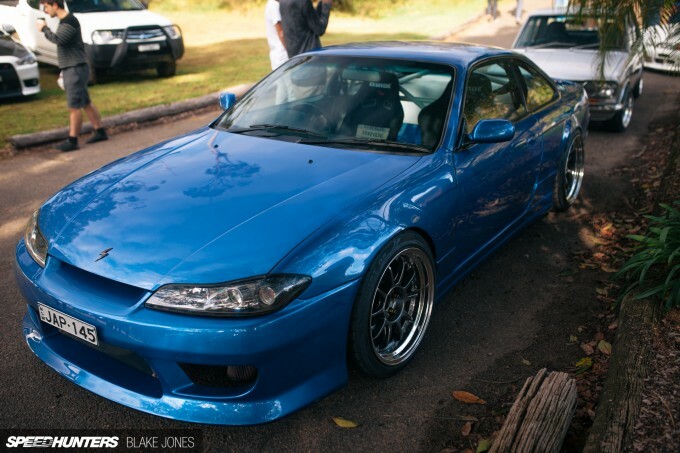 Custom metal front guards were fabricated to match the JDM-spec S15 front end with the S14 body. This would be easy to make look wrong, but here the end result could be easily mistaken for factory. Check out the swage line that extends from the door into the front guard – a small detail with a big impact on the overall look and feel. Front brakes are Brembos donated from a Mitsubishi Lancer Evolution VIII. Underneath the skin is basically a shopping list of dream parts for an S-chassis drift build: an SR20DET with in excess of 350kW (470hp), Nismo clutch and LSD, GReddy coilovers and a bevy of other specialized suspension components mounted to a reinforced subframe. Taking a peak inside revealed even more goodies including a Haltech IQ3 digital dash, fixed Bride buckets and the quintessential Nardi steering wheel. Tucked in front of the stock handbrake is a lever attached to a SW Motorsport hydraulic system. I love that the rest of the interior and dash has been left intact and clean – it looks like a nice place to conduct some serious tyre shredding from! It wasn’t until talking to the owner after the event that I realized just how well thought out and executed this build is. I really wish I’d had the chance to spend some more time with the car but alas, a Spotlight will suffice for now. Quality builds like this are flying the flag for well-built Japanese cars and no doubt in years to come will be as valued as the Porsches, Alfas and VWs that collectors fight over today. Really, really nice car! The owner put some serious work in and the attention to detail is fantastic! Cracking car, love the number plate! I was chatting to the owner of this when I snapped a few photos, the engine bay work had me astounded the attention to detail was brilliant right down to the stitch welding on the front tubs. AnthonyAntBolic pictures or it didn't happend!! mnchk1987 AnthonyAntBolic sadly I didn't get any i think i was to taken back by how clean the car was to take photos. The guy who owns the car was so modest about it which is a nice show of character. The diversion panels in the front bar for the intercooler, oil cooler, & filter was the part that caught my eye. I hope more photos pop up because it was astounding. To be clear, JPN is the accepted abbreviation due to the usual racist connotation. But, casual racism in Australia is a way of life. Awesome engine selection, awesome stance, well fitting tires/wheels and that color! Now THIS is a drift build! @Not a Racist Aussie lasty1977 I don't think it's racist at all! It's short for 'Japanese S14.5'. Obviously you can only fit 6 characters on NSW number plates and with so many Japanese imports on the roads, I'd daresay JPN-145 was already taken. No-one is referring to the Japanese as 'Japs' here in a racist way at all. BT180 lasty1977 Japanese people regard being referred to as 'Japs' derogatory. Bro5 BT180 lasty1977 I agree, but no-one here is calling any people here 'Japs'. kphillips9936 It's a drift build only once it's actually drifted. Nice car though, looks clean! @Not a Racist Aussie lasty1977 Ugh! Yeah, because Nig and Jap are so similar. I'm always referring to Japanese wheels as Jap wheels, never had anyone call me racist over it. Some people are too precious these days. Mike_Holst For Sure! It pains me when I see some of the builds out there that obviously have ALOT of work put into them with tuning, exhaust, paint, parts fab and rare parts being sourced and installed... only to then be just totally dumped to the ground. All that nice bodywork just to let the frame rails drag around as well as the performance modifications being pretty much useless since launching or cornering the car would destroy it. Also, all these beautiful pictures of a beautiful car, and not ONE picture of the engine bay that's teased in the 3rd from end paragraph? C'mon! 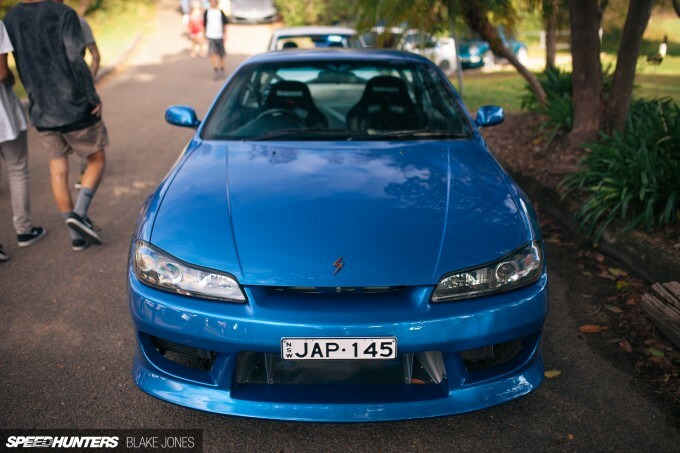 This front end swap still offends me, even more so on a S14. In my opion the stock front end with a proper lip kit puts the played the hell out S15 front end to shame. Lol S14.5... people still do this...? Spaghetti Curiously, as I am sure the irony is lost on you, they are just the same; yes. Perhaps if I had said putting 'WOG-124' on my Fiat you may have understood the term 'vaguely racist'? Your flippant use of the term 'Jap', and that no one calls you on it in Aus too, fits perfectly with the observation casual racism is rife in Australia, as most are not even aware of when they are being inappropriate. @Not a Racist Aussie Spaghetti Jap, Aus. What's the difference? Spaghetti Also how do you know the owner isn't Japanese? I know a guy who has 2 cars with plates WOGBOY and WOGTOY. And he is Greek. BNR32Dan I mean....people have been swapping front ends on S-chassis since the beginning of time, hell even nissan sold front end swapped cars themselves (sileighty) its part of the fun of the S-chassis. If it looks well done who cares. BNR32Dan Looks pretty good to me. Depends on context, as within Aus, UK, USA, the word Jap isn't generally used as a perjorative term, but you are right to some extent because now that we are a more global society, our attitudes change and we become more aware of what is appropriate across borders. It depends more on individual inference as to how racist something like this seems, as it's not intended to cause offense. Also, it's worth mentioning that being "offended" is often something that unscrupulous people use for leverage in this day and age, so as well as being more sensitive to global sensibilities and semantics, it also pays to be wary of jerkoffs that make a big deal over nothing. I'm not accusing you of this but it's pertinent to the issue. In Europe we have a car show called 'Japfest' and I've been wondering at what point they're going to decide to call it something different. People still regularly refer to Japanese cars as Jap cars but I find that I never use the term any more because it just doesn't sound right. I know I wouldn't mean anything bad by it but I guess I'm more sensitive to the possibility of it sounding very disrespectful, even in a society where there are really very few Japanese people. I done typed a lot again. @ericlastname S14 with S15 front. Hence S14.5. S13 with 15 front is S13.5. Understand? Slappy_Pistons lasty1977 Just a correction. At least here on the west coast USA, Jap is a highly racist pejorative that would most likely result in physical harm to the offender. The first time I personally heard someone use it in a conversation was surprisingly when I was living in the UK at the time. Hydrolastic Slappy_Pistons lasty1977 Thanks, yeah I should have realised; internment camps etc, still a very raw memory for many Japanese Americans - very sad. S13(180) with S13 (coupe) front; S13.3? 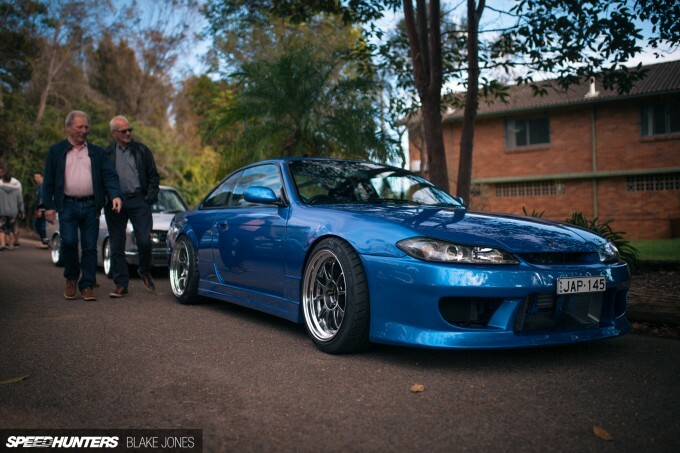 So its an s14, with a s15 front end, and subaru blue? I'm sorry am i dreaming? No. Then it's a Sileighty. Or the other way round is a Onevia. The whole Jap thing is interesting. I genuinely don't think it's meant in a pejorative sense. It isn't in The UK. As another poster said there are all sorts of businesses and events with Jap in the title. To us 'Nip' is very much a racist word. Presumably the Japanese firms who sell things to distributors here don't think they're dealing with racists! @Brisk It's offensive. Yes, that's a period after that last sentence. I actually refused to look at this post until I decided to comment about how offensive it is. People can split hairs about the degrees of insensitivity there is in using it...maybe even try to justify it's use. However, people from the country of JAPAN are JAPANESE, not Japs. Again, period. from Australia and have never recognised the jap abbreviation as racist. I guess things are just more laid back here, for example we get portrayed by Americans in your movies with that stupid effing accent and we call you seppos, and both are seen as good fun! There is a japanese guy that runs a japanese car dismantler and importing business called 'jap plus' near where i live.